Since 1981, Assemblies of God Heritage has shared the stories of the people, ministries, and themes that have shaped the Assemblies of God USA. 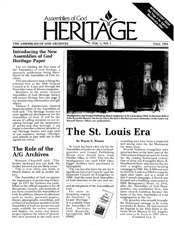 Published by the Flower Pentecostal Heritage Center (originally Assemblies of God Archives), Assemblies of God Heritage is the only Pentecostal history magazine of its kind in the world. Initially a slim quarterly publication, beginning in 2007 an expanded annual edition replaced the quarterly issues.